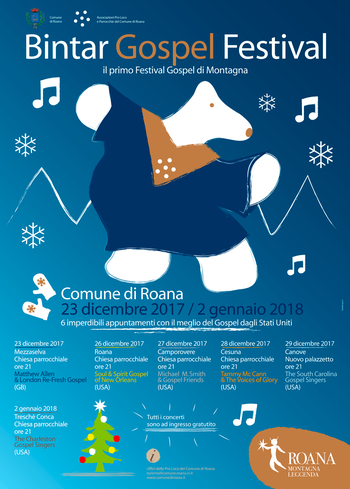 After the extraordinary success of the past years, this year for the holiday season back on theAsiago plateau, one of the most popular musical events ever: BINTAR GOSPEL FESTIVAL. From December 23 to January 2 2018 2017, waiting 6 missed appointments in Roana and fractions with the best of international gospelmusic, to celebrate the Christmas through joy, positivity and the sense of communion that singing Gospel-Spiritual manages to convey. To start the event will be the choir Matthew Allen & london Re-Fresh Gospel, who will perform on December 23 to Mittewald. Then follow the performances of Soul & Gospel spirits of New Orleans in Roana, Michael m. Smith & Gospel Friends to See, by Tammy Mccann & The Voices of Glory in Cesuna, by The South Carolina Gospel Singers in Canove and The Charleston Gospel Singers in in Treschè Hollow.